Today your relaxation begins, for a hassle free start to your vacation we will provide you with an arrival transfer from either Bodrum Airport or Bus Station to Hotel Kalender where you will spend the next 5 Nights. After we have checked you into Hotel Kalender, we have organised a trip to a traditional Hamam also know as a Turkish Bath. The Turkish bath is a place, where physical and spiritual cleaning takes place and is hundreds of years old. In 1741 Istanbul built its first public bath house in Sultan Mehmet. Natural lighting and izonic coloured tiles create a relaxing atmosphere. When entering to Turkish bath, you leave all the hastiness of daily life outside, you exchange your clothes for a waistcloth and adorn the traditional clogs. Inside temperature reach up to 50 degrees celcius under the central dome of the building. This heat and humidite opens the pores of body and extracts the fatty anoils of the body in preperation for your scrub down and amassage by the attendant. After a gentle soap massage you leave the bath place with towels and pass to resting room. Here, tea is offered to you. You leave the Turkish Bath renewed, beautiful and refreshed. We will head back to Hotel Kalender where a freshly prepared home cooked evening meal is awaiting us. After Breakfast you will be greeted at your hotel and will be taken by car to Camel Beach. 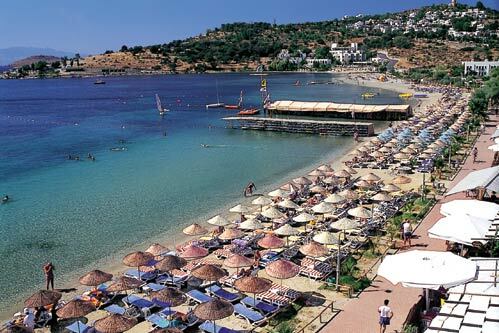 Camel Beach, is also known as Yhasi beach and is one of Bodrum's most popular beaches. Sitting in a southerly direction on the peninsula, Camel beach is a fine stretch of sand with wonderful views. 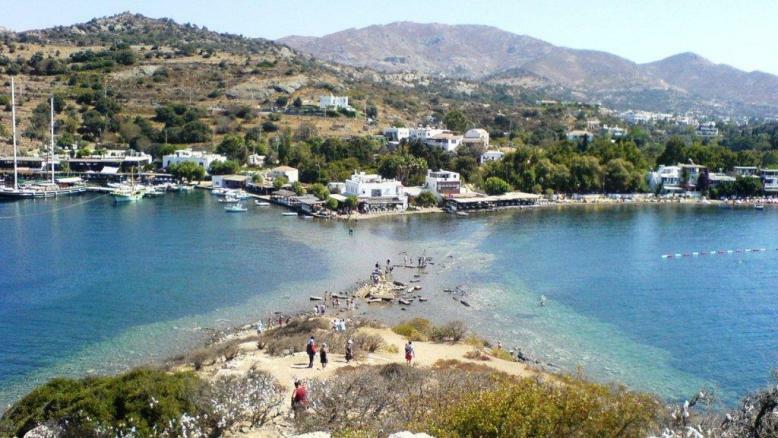 It is accessible by boat or a dolmus but since it is located out of the main tourist resort, there are a lot less people at this beach, which means the beach and the sea are also clean and less crowded. Some consider the water here to be warmer than the other Bodrum beaches. Among other activities, camel riding seems to be the most popular with tourists. Although after you are finished enjoying the camel rides, make sure to look for the ancient ruins that can be found on the sea floor. this beautiful, long, sandy beach provides the most perfect setting for Beachside bars where you can take a drink beside the Aegean sea. After you have spent the day sunbathing, swimming and relaxing we will pick you up and transfer you back to Hotel Kalender for your evening meal. Enjoy your home cooked breakfast at Hotel Kalender, before you are greeted and transferred to Turgutreis where you will spend the day. With its extensive beaches, marina, marketplace and gentle breezes, Turgutreis, the largest bay on the Bodrum peninsula, has become a recent favorite with vacationers. All along the shore, from one end to the other, no matter where you stand, no matter where you look from, you will feel that you are in a place where the sunset is always beautiful. With its endless beaches, its own unique street of bars, and its Marina, as well as an enormous open air market, giant supermarkets, a covered bazaar where you can find anything and everything has made Turgutreis a popular resort among holiday makers. Once you have explored the Bazaar, strolled the marina and relaxed on the beach, we will provide a transfer back to Hotel Kalender, where your evening meal and drink at the hotel bar will provide the perfect end to a perfect day. After Breakfast we will take you on a 20 minute drive to Golturbuku. Golturbuku, is located on the north of Bodrum peninsula 22 kms from Bodrum and is very populat place for Turkish artists and celebraties.There is a small private museum displaying historical figurines. Along the beach, there are small jetties on which people relax and sunbathe. Turkbuku safely tucked in the surrounding hillsides on the west side of the bay and sheltered by two islands the village of Turkbuku is a natural haven for area fishermen, who still operate from the many wooden jetties along the beachfront. Just outside the bay are popular fishing grounds for dil baligi, or sole. Further on, at the foot of the bay, the village of Golkoy occupies a verdant green valley fronted by a long sandy beach with small pensions and restaurants. The delights of Golkoy are many, but perhaps foremost among them is the ability, to enjoy the quiet native atmosphere of fishermen, farmers and tradesmen going about their daily tasks with little concern for the noise and hustle and bustle of modern life. Once you have finished living the life of a Turkish celebrity its time to head back to Hotel Kalender to enjoy a poolside evening meal. After our freshly prepared home cooked breakfast we will transfer you by car to Karaincir. Karaincir's 500 metre long fine sandy beach is surrounded by two hills and is closed to the northern winds, helping it to become a developing tourism centre. Once it was known for the abundance of its figs. This region gained colour with the coming of the holiday resorts and hotels. However, most of all it is the makeshift restaurants lined up behind the beach that are popular. All are competing with each other to serve the most delicious dishes, especially borek (pastries). In the open sea there are 14 smaller and bigger islands, with Yassiada with its wrecks attracting Archaeologist and Divers As the evening approaches its time to head back to our hotel and prepare for an extra special evening as tonight we will be dining in a popular seafood restaurant in Gumusluk. 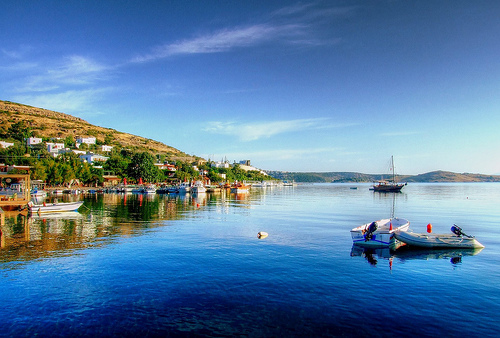 Gumusluk Bodrum's prettiest resort town hugs the remains of ancient Myndos on the western side of the peninsula. Here, small hotels, pensions and fish restaurants overlook a lovely swathe of sand. The perfect way to enjoy our last night in Bodrum. After breakfast its time to check out , we will provide you with a departure transfer to either Bodrum Airport or Bodrum Bus Station.